Kydyrgali Ongarbaev is a promising sportsman from Kazakhstan, representing the famous club "Shardara Armsport". Kydyrgali recently pulled at a tournament in Croatia, where he showed a good result. Kydyrgali, what are you doing now? Are you ready to pull at the World Championship? - During the championship of the Republic of Kazakhstan I received a serious elbow injury in a fight with the world champion Alexander Getalo. After this injury I do not work with training. That is the reason why I miss this World Championship. At the last World championship you pulled in the category up to 90 kg, what can you say about the composition of this category in the last European championship? - Yes, guys 90kg from the European Championship are very strong. But at the world championship there will be athletes from Asia. I think they will be able to stand up to the Europeans. Watching your last performances we admitted that you added in weight, how much do you weigh now and in what category do you plan to pull? - As I said before, I have not been training for 5 months, therefore, I have not followed any diet. At the moment my weight is 98 kg. And from the beginning of September I want to start training for the Zloty Tur. I think I will come to my usual weight of 90 kg. At the tournament in Croatia, you met Sasho Andreev. How can you evaluate his strength and his level? What was not enough for you to win over him? - Yes, in Croatia, I fought with Sasho Andreev. He is very strong and promising heavyweight! And a nice person. I think I did not have enough training. In principle, I went there as a trainer of the sports club "Shardara Armsport", but when I saw armtable and felt the atmosphere, I could not resist and registered to take part. Would like to take part in the tournament on the system of armfight? Who would like to see his rival? - I am always ready to fight with any athlete in the 90-100 kg category. If there is a proposal to participate in the Armfight, I will prepare for 100 percent, and I will try to get out of the winner. Our team participates annually in the Professional World Cup, and each time we win in several categories. This is already an application for participation in the armfights. But so far, organizers do not invite us for such bouts yet. We have a lot of strong armwrestlers, and they are ready to accept the challenge at any time. 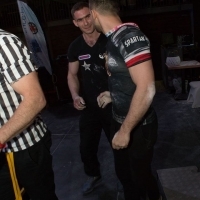 The level of participants in the category up to 90 kg at the World Cup will be very high and Kydyrgali would definitely make him even higher, and he would have had a chance to place in the prize trio. However, as the athlete said, he misses the World Cup, and we will see him already on Zloty Tur in November.